Background and objectives: Treatment with IFN is rarely associated with nephrotic syndrome and renal biopsy findings of minimal-change disease or FSGS. Design, setting, participants, & measurements: We report 11 cases of collapsing FSGS that developed during treatment with IFN and improved after discontinuation of therapy. Results: The cohort consists of seven women and four men with a mean age of 48.2 yr. Ten of the 11 patients were black. Six patients were receiving IFN-α for hepatitis C virus infection (n = 5) or malignant melanoma (n = 1), three were receiving IFN-β for multiple sclerosis, and two were treated with IFN-γ for idiopathic pulmonary fibrosis. After a mean and median duration of therapy of 4.0 and 12.6 months, respectively, patients presented with acute renal failure (mean creatinine 3.5 mg/dl) and nephrotic-range proteinuria (mean 24-hour urine protein 9.7 g). Renal biopsy revealed collapsing FSGS with extensive foot process effacement and many endothelial tubuloreticular inclusions. Follow-up was available for 10 patients, all of whom discontinued IFN. At a mean of 23.6 months, nine of 10 patients had improvement in renal function, including one with complete remission and two with partial remission. Among the seven patients with available data, mean proteinuria declined from 9.9 to 3.0 g/d. Four of the seven patients were treated with immunosuppression, and there was no detectable benefit. Conclusions: Collapsing FSGS may occur after treatment with IFN-α, -β, or -γ and is typically accompanied by the ultrastructural finding of endothelial tubuloreticular inclusions. Optimal therapy includes discontinuation of IFN. FSGS is the most common cause of idiopathic nephrotic syndrome in black patients and may be the most frequent cause of nephrotic syndrome in the general population (1–6). The spectrum of FSGS includes primary forms mediated by a putative circulating or permeability factor and a number of secondary forms caused by such diverse insults as hereditable mutations in podocyte genes, drugs, viral infections, and adaptive responses to reduced renal mass or other hemodynamic stress (1). A variety of histologic variants of FSGS have been identified and can be applied to both primary and secondary forms (7–9). Many secondary forms tend to manifest as particular morphologic subtypes (1). The collapsing variant of FSGS is defined by implosive wrinkling and “collapse” of the glomerular basement membrane associated with hypertrophy and hyperplasia of overlying podocytes (10–12). Collapsing FSGS was mainly described in patients with HIV-associated nephropathy (HIVAN) (13) but also was recognized as a variant of idiopathic FSGS (11,12). Both idiopathic collapsing FSGS and HIVAN are most commonly seen in young black patients (8–12,14). Compared with the usual, most common form of FSGS with discrete segmental scars (FSGS not otherwise specified [FSGS NOS]), collapsing FSGS is distinguished by more severe nephrotic syndrome and renal insufficiency at presentation and a more rapid course to renal failure (8–12,14). Central to the morphogenesis of the collapsing variant is podocyte injury that leads to podocyte dedifferentiation, apoptosis, and proliferation, in part through dysregulation of cell cycle–related proteins (15–19). Podocyte precursor cells from the parietal cell layer may contribute to the glomerular epithelial cell proliferation (20). HIVAN is not the only established secondary cause of collapsing FSGS. Collapsing FSGS has been reported in the setting of Parvovirus B19 infection (21) and in patients with hemophagocytic syndrome (with or without underlying lymphoma) (22). Collapsing FSGS also may follow treatment with pamidronate (23), with 15 cases reported in the medical literature (23,24). In contrast, FSGS NOS has been reported to result from treatment with lithium (25), sirolimus (26), and more recently anabolic steroids (27). Although rare cases of collapsing FSGS also have been reported after treatment with IFN-α (28–30), this therapeutic agent is more commonly associated with minimal-change disease (MCD) (31–38) and FSGS NOS (39–47). We report 11 additional cases of collapsing FSGS that developed during treatment with IFN, including six IFN-α (for hepatitis C virus [HCV] infection or melanoma), three IFN-β (for multiple sclerosis [MS]), and two IFN-γ (for idiopathic pulmonary fibrosis). Eleven cases of collapsing FSGS after treatment with IFN-α, -β, or -γ were identified from the archives of the Renal Pathology Laboratory of Columbia University Medical Center. The 11 biopsies were received from 1999 through 2008, during which time 15,783 native renal biopsies were processed in the laboratory. The biopsies were received from 11 nephrologists at 10 hospitals in five states, for a biopsy incidence of 0.07%. All cases were processed for light microscopy, immunofluorescence, and electron microscopy according to standard techniques, and in all cases, glomeruli were available for all three modalities of evaluation. The diagnosis of collapsing FSGS was based on a proposed morphologic classification system (7). In brief, the collapsing variant requires at least one glomerulus with the defining features of wrinkling and retraction of the glomerular basement membrane (“collapse”) and hypertrophy and hyperplasia of overlying visceral epithelial cells. Tubular atrophy and interstitial fibrosis and interstitial inflammation were graded on a scale of mild, moderate, and severe corresponding to 0 to 25%, 26 to 50%, and 51 to 100% of the cortex sampled, respectively. Similarly, the degree of vascular disease was graded as mild, moderate, and severe on the basis of the extent of luminal narrowing. For immunofluorescence, 3-μm cryostat sections were stained with FITC-conjugated rabbit anti-human IgG, IgM, IgA, C3, C1q, κ light chain, and λ light chain (Dako Corp., Carpinteria, CA). Electron microscopy was performed with a JEOL 100S or JEOL 1010 electron microscope. The degree of foot process effacement was estimated as the percentage of nonsclerosed glomerular capillary surface area exhibiting effaced foot processes in all electron microscopic fields examined. The number of endothelial tubuloreticular inclusions (TRIs) was evaluated on a scale of 0 to 3 (0, negative; 1, one TRI per glomerulus; 2, two to three TRIs per glomerulus; and 3, four or more TRIs per glomerulus). Patient charts were reviewed retrospectively for presenting symptoms, laboratory findings, details of treatment with IFN, post-biopsy treatment, and follow-up. The following definitions were used: Nephrotic-range proteinuria (NRP; 24-hour urine protein >3 g/d); hypoalbuminemia (serum albumin <3.5 g/dl); and renal insufficiency (serum creatinine >1.2 mg/dl). Nephrotic syndrome was defined as NRP, hypoalbuminemia, and peripheral edema. Hypertension was defined as systolic BP >140 mmHg, diastolic BP >90 mmHg, or active treatment with antihypertensive agents. For the purpose of outcomes analysis, the following definitions were applied: Stable renal function (SRF) was defined as a change in serum creatinine of ≤20% of the initial value. Complete remission (CR) was defined as a 24-hour urine protein of ≤300 mg/d and SRF at last follow-up. Partial remission (PR) was defined by the presence of a 24-hour urine protein of ≤2 g/d, a reduction in proteinuria of at least 50%, and SRF at last follow-up. This study was approved by the Institutional Review Board of Columbia University. The cohort of 11 patients with FSGS after treatment with IFN included seven women and four men with a mean age of 48.2 years (range 27 to 69 years; Table 1). Ten of the 11 patients were African-American, and one patient was of Hispanic origin. Six patients were treated with IFN-α for either HCV infection (5 patients) or malignant melanoma (1 patient). Three patients were receiving IFN-β for MS, and two patients were receiving IFN-γ for idiopathic pulmonary fibrosis. To our knowledge, the particular IFN formulation was administered to each patient at standard therapeutic dosages (IFN-α for HCV: 3 million units (MU) subcutaneously three times per week; IFN-α for melanoma: 20 MU/m2 subcutaneously for 5 d for 4 consecutive weeks followed by 10 MU/m2 three times per week; IFN-β1A: 30 μg intramuscularly once per week or 22 to 44 μg subcutaneously three times per week; IFN-β1B: 8 MU subcutaneously every other day; IFN-γ: 50 μg/m2 subcutaneously three times per week). The median and mean duration of IFN therapy at the time of renal biopsy was 4.0 and 12.6 mo, respectively. A shorter duration of treatment was seen for the majority of patients who were treated with IFN-α (mean 3.3 months). Seven of the 11 patients had a history of hypertension, and two had a history of diabetes, although neither of the patients with diabetes had a history of nephropathy or retinopathy. Medical history also included obesity in three patients, remote intravenous drug use in three patients (all with HCV infection), hypothyroidism in two patients, and rheumatoid arthritis and Raynaud phenomenon in one patient. Patient 2 was the subject of a previous report (28). At the time of biopsy, the mean serum creatinine was 3.5 mg/dl, and 10 of 11 patients had evidence of renal insufficiency (Table 1). The mean 24-hour urine protein was 9.7 g/d, and nine of 11 patients had NRP. Ten patients had hypoalbuminemia and six had edema, all of whom met criteria for full nephrotic syndrome. Five patients had microhematuria and one had leukocyturia, but red blood cell casts were not identified in any patient. HIV studies were negative in all seven patients who underwent testing, including all five patients with a history of HCV infection. HIV testing was not performed on the remaining four patients because of the absence of risk factors. Evidence of remote hepatitis B virus infection, without active antigenemia, was present in one patient who had co-infection with HCV. Five of 11 patients had a positive antinuclear antibody, but none of the patients had hypocomplementemia or signs or symptoms of systemic lupus erythematosus (SLE). Clinical follow-up was available for 10 patients, all of whom discontinued treatment with IFN after the renal biopsy (Table 1). Six patients were treated with steroids, including one patient who was treated with cytoxan and steroids for MS. The median and mean duration of follow-up were 14.0 and 23.6 months, respectively. During the period of follow-up, nine of 10 patients had a decline in serum creatinine from a mean of 3.9 mg/dl to a mean of 1.9 mg/dl. Seven of the nine patients reached a final creatinine of ≤1.7 mg/dl, including four who returned to normal range. Follow-up urinary protein levels were available for seven patients, all of whom had a decline in 24-hour urine protein from a mean of 9.9 g/d to a mean of 3.0 g/d. Two of the seven patients met criteria for PR, one had a CR, and the remaining four had a decline in 24-hour urine protein from a mean of 14.7 to 4.9 g/d but did not meet criteria for CR or PR. Four of the seven patients were treated with steroids, including one with PR and three who did not meet criteria for CR or PR. Thus, beyond discontinuation of IFN, no additional benefit of immunosuppressive therapy could be detected. The renal biopsy findings are highlighted in Table 2. The sampling for light microscopy included a mean of 18.5 glomeruli (range 6 to 33 glomeruli). A mean of 34.2% of glomeruli per biopsy exhibited lesions of FSGS (range 4.3 to 83.3%), whereas a mean of 10.2% of glomeruli were globally sclerotic (range 0.0 to 23.1%). All 11 biopsies met defining criteria for collapsing FSGS (7) (Figure 1, A and B). In addition, all biopsies exhibited evidence of acute tubular injury, which was more prominent and diffuse in four cases. The degree of tubular atrophy and interstitial fibrosis ranged from mild (n = 3) to moderate (n = 6) to severe (n = 2). Interstitial inflammation was present in all cases and ranged from mild (n = 6) to moderate (n = 5). Tubular microcysts, a common finding in collapsing FSGS, were identified in four biopsies. Arteriosclerosis and arteriolosclerosis with hyalinosis were identified in eight of 11 biopsies and in all cases were mild to moderate in severity. Immunofluorescence revealed no evidence of immune complex deposition in any of the 11 biopsies. In six of the biopsies, focal staining for IgM and C3 was noted in glomeruli with collapse or segmental sclerosis. Pathologic findings. 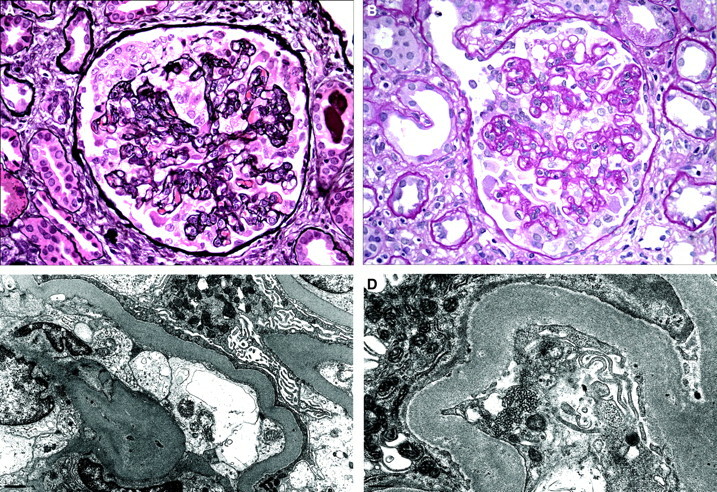 (A) A glomerulus with collapsing FSGS exhibits global wrinkling and retraction of the glomerular basement membranes and diffuse swelling and proliferation of overlying visceral epithelial cells (Jones methenamine silver). (B) In this glomerulus with collapsing FSGS, some of the podocytes are detached from the glomerular basement membrane and lie free within the urinary space (periodic acid Schiff). (C) On ultrastructural evaluation, visceral epithelial cells exhibit microvillous transformation and complete foot process effacement. An endothelial TRI is present. (D) At high magnification, an endothelial TRI is seen. Magnifications: ×400 in A and B; ×5000 in C; ×8000 in D.
By electron microscopy, all biopsies revealed diffuse foot process effacement, which involved a mean of 86.4% of the glomerular capillary wall surface (range 70 to 100%; Figure 1C). Endothelial TRIs, also referred to as “IFN footprints,” were seen in 10 of the 11 biopsies and were noted to be extensive in all 10 cases (Figure 1D). Two biopsies from patients with HCV infection displayed rare small paramesangial electron densities without well-developed electron-dense deposits. Of particular interest, patient 9 was a 37-year-old woman who had been treated with IFN-β-1A for 4 years for MS (Figure 2). After the development of proteinuria (urine protein-creatinine ratio of 2.4) and renal insufficiency (creatinine 2.3 mg/dl), IFN was discontinued, leading to normalization of renal function (creatinine 0.8 mg/dl) and a marked decline in proteinuria (urine protein-creatinine ratio 0.57). More than 3 years later, the patient received a second course of treatment with the same IFN formulation, leading to massive proteinuria (9.97 g/d) and a rise in creatinine to 1.5 mg/dl. Again, discontinuation of IFN led to reduction in proteinuria (1.4 g/d) and improvement in renal function (creatinine 1.2 mg/dl). 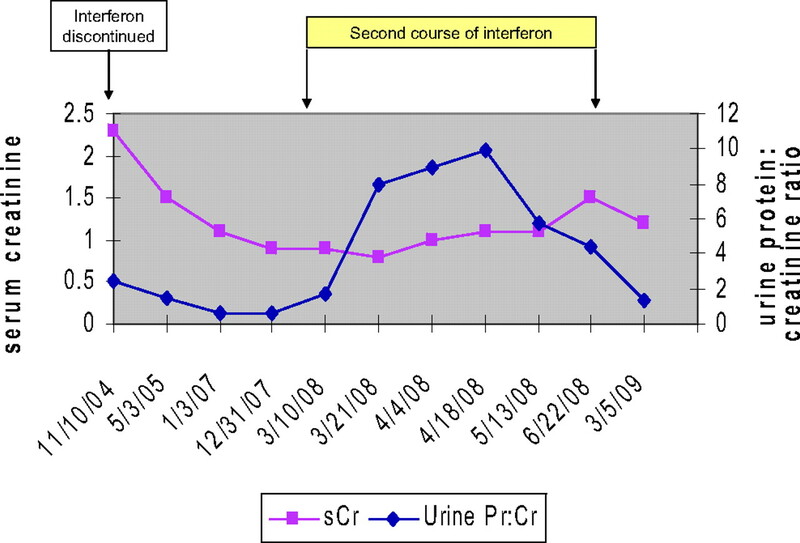 Temporal relationship among serum creatinine, proteinuria, and use of IFN in patient 9. IFN was originally identified in 1957 and was named for its ability to confer viral interference (48). The nomenclature of α, β, and γ is based on the major IFN peaks observed under HPLC. The major cells of origin for α, β, and γ IFN are leukocytes (other than lymphocytes), fibroblasts, and T cells and natural killer cells, respectively. Many other cell types are also capable of synthesizing lower levels of IFN-α and -β when virally infected. IFNs play a role in signaling between immune cells and represent an important component of the innate immune response against viral infection. IFN-α and -β are produced by virally infected cells and induce cellular changes in neighboring cells that prevent viral replication and protein synthesis. In contrast, IFN-γ acts by stimulating macrophage activation and MHC expression and does not directly block viral infection. Recombinant DNA technology has allowed cloning and mass production of IFNs for therapeutic use in multiple medical conditions. IFN-α, including both IFN-α2a and IFN-α2b, is approved for the treatment of chronic HCV infection, hepatitis B virus infection, hairy cell leukemia, follicular lymphoma, malignant melanoma, AIDS-related Kaposi sarcoma, and condyloma acuminata. IFN-β, including both IFN-β1a and IFN-β1b, is indicated solely for the treatment of MS. IFN-γ is approved for the treatment of chronic granulomatous disease and malignant osteopetrosis. IFN-γ also has been studied extensively as treatment for idiopathic pulmonary fibrosis but is no longer recommended for this indication on the basis of the recent large, randomized, placebo-controlled INSPIRE (INternational study of Survival outcomes in idiopathic Pulmonary fibrosis with InteRfEron gamma-1b) trial, which was terminated prematurely because of the absence of efficacy and higher mortality in the treatment group (49). All forms of IFN are administered either subcutaneously or intramuscularly and are associated with significant adverse effects that frequently limit use, including acute constitutional symptoms, chronic fatigue and anorexia, neurologic toxicity, autoimmune thyroiditis, hepatotoxicity, and neutropenia. Given the frequency of these serious adverse effects, it is not surprising that the relatively infrequent occurrence of nephrotoxicity has received much less attention. A spectrum of podocytopathies has been described in the setting of chronic treatment with IFN (Table 3). There have been eight case reports of nephrotic syndrome as a result of MCD, including six patients who were treated with INF-α and two who were treated with IFN-β. IFN was discontinued in all eight patients, three of whom also received steroids. All eight patients went into remission, including CR in six. Interestingly, IFN was subsequently reintroduced in three patients (31,32,37), followed by recurrence of nephrotic syndrome in two (31,32). Reports of FSGS after treatment with IFN have included FSGS of the usual type (FSGS NOS) (10 cases) and collapsing FSGS (three cases; Table 3). Among the 13 reported cases, at least 12 had full nephrotic syndrome and 11 had acute renal failure (with information about nephrotic parameters unavailable in one case) (30). Twelve patients were receiving IFN-α, and one patient was being treated with IFN-γ. IFN was discontinued in all patients, and eight also received steroids. A decline in proteinuria and improvement in renal function were documented in nine of 10 patients with available follow-up, although only one patient had a CR (39) and only three had a PR (40,44,46). Of note, all three reported patients with collapsing FSGS were receiving IFN-α, including one (28) from our center, who also is included in this study (patient 2). Furthermore, one of the three cases of purported collapsing FSGS is complicated by the fact that the patient had a creatinine of 2.5 mg/dl and biopsy-proven diabetic glomerulosclerosis before receiving IFN-α (30). Of note, there are also reports of patients who were treated with IFN and had renal biopsy findings of thrombotic microangiopathy (50) and acute tubular necrosis (51). In addition, reversible IFN-associated nephrotic syndrome in the absence of renal biopsy has been described (52). In contrast to the reported cases in Table 3, all 11 patients in our cohort who developed podocytopathies in the setting of treatment with IFN had biopsy findings of collapsing FSGS. Similar to the reports of collapsing FSGS and FSGS NOS in Table 3, our patients presented with nephrotic syndrome and renal insufficiency and had a strong black racial predominance. Outcomes were also similar, with most patients experiencing an improvement in renal function and reduction in proteinuria but few patients meeting criteria for CR or PR. Given the generally poor outcome in patients with idiopathic collapsing FSGS (8–12,14), the improvement after discontinuation of IFN-α, -β, and -γ argues strongly in favor of its causative role in the development of collapsing FSGS in our cohort. This causative relationship is further strengthened by the reports of recurrent nephrotic syndrome after reintroduction of IFN (patient 9) (31,32). It is interesting to note that the mean duration of IFN therapy before the development of collapsing FSGS was 2.95 months for the eight patients who were treated with IFN-α (Tables 1 and 3). In contrast, the development of collapsing FSGS occurred after 3 and 4 years of treatment with IFN-β in the two patients with available data (Table 1). There are two important distinctions between our cohort and the reported cases in Table 3. First, we identified only cases of collapsing FSGS, whereas the majority of reports describe FSGS of the usual or NOS type. This discrepancy may relate to differences in nomenclature, because many of the reports of FSGS NOS were published around the time that collapsing FSGS was becoming a recognized entity. Furthermore, almost all of the cases in Table 3 were reported before the publication of a working proposal for the classification of FSGS (7), which requires only a single collapsing lesion to diagnose the collapsing variant. Our report is also the first to describe a high prevalence of endothelial TRIs (n in 10 of 11 patients). Endothelial TRIs are interanastamosing microtubular structures that are seen mainly within the cytoplasm of endothelial cells and most commonly encountered in the setting of SLE and HIV infection. Because TRIs can be induced in tissue culture or animal models by exposure to IFN-α, these structures have been referred to as “IFN footprints” (53,54). Our only case without detectable TRIs had suboptimal tissue for ultrastructural evaluation, leading us to conclude that TRIs are a characteristic and diagnostically helpful feature of collapsing FSGS secondary to treatment with IFN. Of course, HIV nephropathy should always be excluded in the setting of collapsing FSGS with TRIs. Even in the setting of HIV infection and collapsing FSGS, a history of treatment with IFN should be sought because of the high prevalence of HIV and HCV co-infection. How IFN therapy causes collapsing FSGS is unknown. Possibilities include direct effects of IFN on the podocyte or indirect effects via altered cytokine milieu. IFN-α and IFN-β act via binding to the α/β receptor, whereas IFN-γ is recognized by a separate receptor. Receptor engagement leads to transcription of multiple IFN response genes that encode proteins that interfere with viral replication and assembly, suppress cellular proliferation, increase antimicrobial resistance, and alter cell metabolism. Although there is some overlap in subcellular pathways, receptor activation by IFN-γ leads to enhanced oxidative capacity of macrophages, natural killer cell activation, and increased expression of MHC genes. One or more of these subcellular events may also be operant in the podocyte, which expresses the α/β receptor and can be stimulated by IFN-γ in vitro to express MHC class II antigens and intercellular adhesion molecule 1 (55). IFNs are known to activate adaptive immune mechanisms (including Th1 response) that promote macrophage activation. Generalized macrophage activation is the key process that underlies hemophagocytic syndrome, a condition that is associated with collapsing FSGS (22). Of interest, podocytopathies including FSGS can also occur in SLE (56), an autoimmune condition with high circulating levels of IFN. The possibility that IFN could participate in collapsing glomerulopathies related to viral infections such as HIV and parvovirus B19 deserves further study. A central role for activation of the Th1 response has been proposed for some forms of collapsing FSGS (57). It remains to be determined how IFN may alter the synthesis of other, potentially pathogenic cytokines, such as IL-6 or IL-13 family members, which have been incriminated as permeability factors in FSGS and MCD (58,59). We report 11 cases of collapsing FSGS after treatment with IFN-α, -β, or -γ. This is the first report of FSGS after the use of IFN-β, the first description of collapsing FSGS in patients who were treated with IFN-γ, and the first study to emphasize the frequency and diagnostic importance of endothelial TRIs. Optimal therapy for this lesion includes discontinuation of treatment with IFN; the role of additional immunosuppressive therapy remains undefined. Similar to pamidronate, IFN should be considered a well-established cause of drug-induced collapsing FSGS.